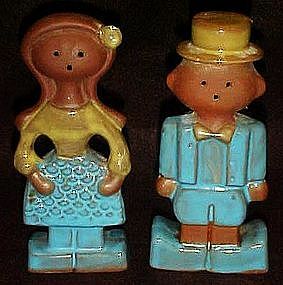 Vintage clay man and woman salt and pepper shakers. A very unique and different set of retro shakers from the 1960's era. Made of partial unglazed clay and the man and woman's clothing are made with a heavy glaze, giving an interesting effect. The shaker holes are in the face. Measures 5 1/4" tall and are rather flat shaped. Pristine condition but no corks. These are wonderful and unique to add to your collection!